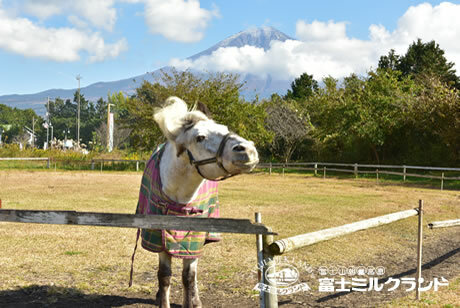 Experiencing | Visit Fuji Milkland at the foot of Mount Fuji in Asagiri Kogen highland. Try a hands-on project! Become friends with animals! If you know when you will be visiting or want to make sure you can try an activity, please contact us beforehand. Group leaders and school administrators, please contact us first. This activity takes only 15 minutes. Shake and make your own butter, spread on a salt cracker and try it! 11 a.m. and 2 p.m. every day. 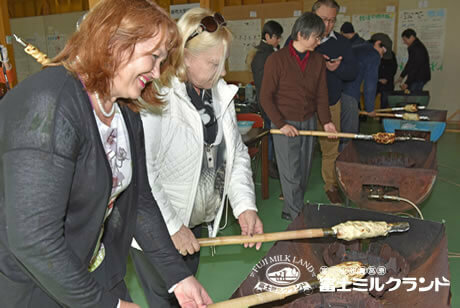 Everyone can try their skills at making the best log cake. Fresh made cakes are tasty! Please see the Events page for seasonal activities. we can hold this activity especially for you. ■ Easy cheese making (45 minutes). 400 yen per person (served with crackers). The guests make groups of 4 and make soft cottage cheese. ■ Ice Cream making (45 minutes). 1,200 yen per person. The guests make groups of 2 to 4 and make all hand-made ice cream with no additives. Please make a reservation 7 days in advance. 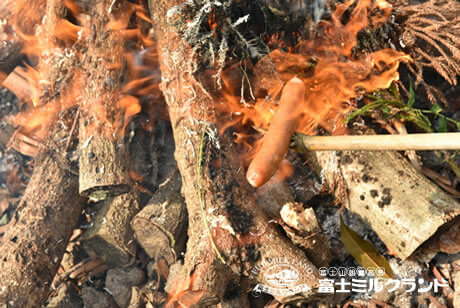 Roast sausages over fire. Make butter and spread on roasted sweet potatoes. Can be held on demand on weekdays for groups of 10 or more. Each set includes a forked sticks and a bamboo. Please do not give your own food to animals. Recently there have been issues of guests giving their own feed to animals. Even naturally grown plants and flowers can threaten animals’ health. Please refrain from picking plants/flowers and feeding them. We have food that is unharmful and designed to meet the needs of animals. Also, it is important that baby animals not be fed the food sold in cups. Babies will have upset stomachs when fed with improper food. Thank you for your cooperation. Depending on the condition of the cow, activity time may change. An adult may assist a child free of charge. The horse takes you once around the riding ground. 2 children cannot ride together at once. 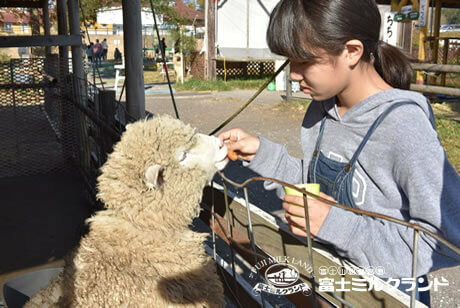 Try feeding fresh vegetables to the sheeps and goats on the farm. Let your dog run as much as they want! 300 yen per dog (tax included), 200 yen per second dog and after (tax included). The pool is filled with leaves from Japanese chestnut oaks in the area. 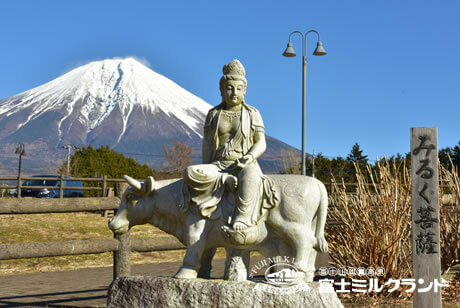 Take a look at Mount Fuji from this statue. A great place for taking photographs. 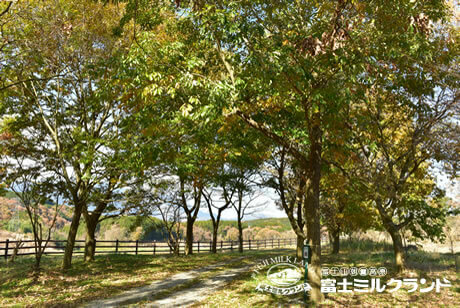 Take a walk in the woods while looking at Mount Fuji. Focus on breathing out as you walk to turn up your parasympathetid nervous system. You will feel more relaxed and free of stress. Along the promenade is a hammock. Get up there, lie down, look at the sky and enjoy a view you don’t normally see. Feel free to use it anytime. Balls, frisbees and other play items are available for free renting at the Animal Park. Please ask one of our employees. 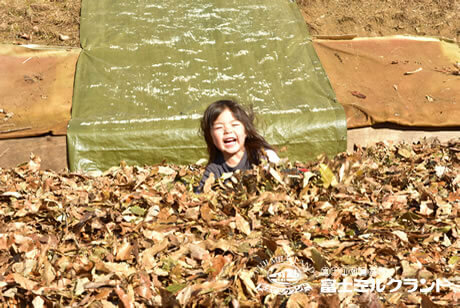 The larva are large as they feed on fallen leaves from the Fallen Leaves Pool and manure from the farm. 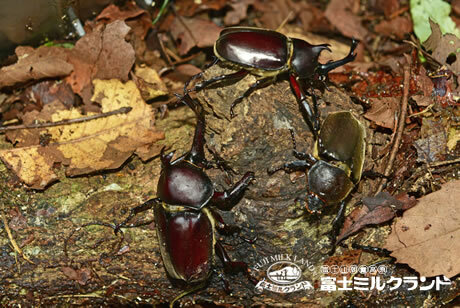 1,000 yen (tax included) Includes 2 rhinoceros beetles and a cage. Milkland may limit the number of entrants into the facility. 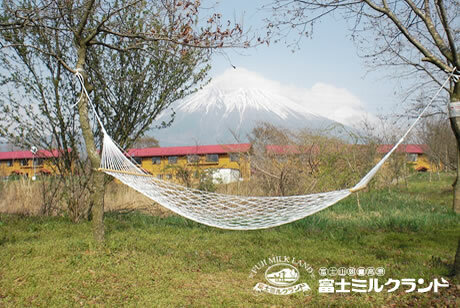 Explore the Mount Fuji Akagiri Kogen Highlands. Reservations necessary. Please call or use the inquiry form to sign up. Please make reservations at least one week before your visit. Free up to 3 days before your visit. 20% of the fee from 2 days to 1 day before your visit. 40% of the fee on the day of your visit. 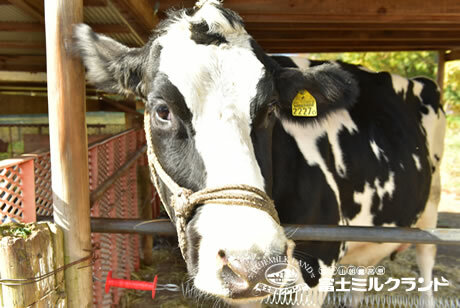 Help taking care of the cows by milking, feeding, and brushing. Also make some butter. Bread and milk included. Afternoon session 1:30 p.m. to 3:30 p.m.
A trainer will walk alongside the horse. 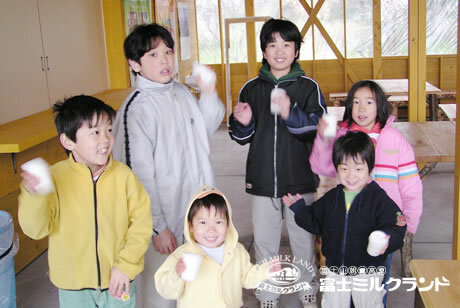 Small children can take part in this experience. The goal of this one-on-one lesson is to control the horse and ride with a little speed. Customized one-on-one lesson for visitors with riding experience. 9:30 a.m. to 4 p.m. (on demand) Closed on Mondays. 1,000 yen per person per hour. Fish 2 trouts and grill them on charcoal. 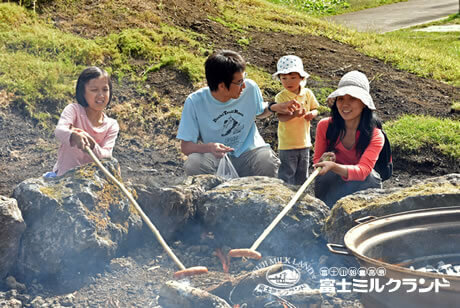 2,200 yen per family per 1.5 hours. 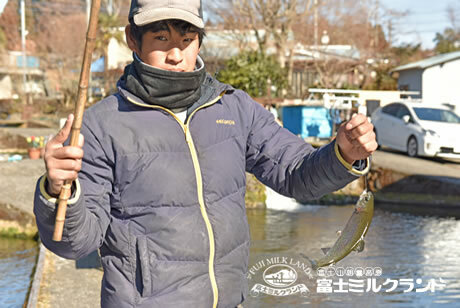 Share one rod and fish 5 trouts. Comes with charcoal grilling and fish bait.